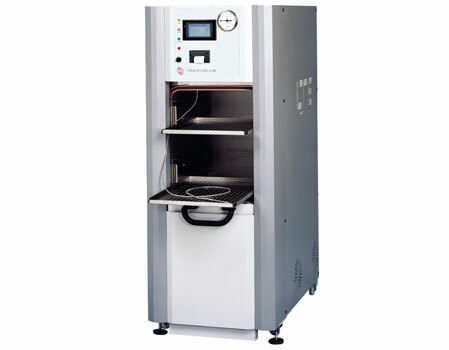 LTE Touchclave Systems Porous Load Autoclaves provide medium to large capacity sterilization solutions for CSSD/HSDU. Our range of porous load rectangular chambered sterilizers are available in eight standard sizes and 326 to 1052 litres. Larger sized units up to 10,000 litres can also be provided. All models can be configured for either single entry or pass-through. All Touchclave Systems models are fitted with a wide selection of features as standard, all designed to ensure optimum performance and the fastest possible cycle times. In addition to traditional loading trolley systems, LTE is also able to provide assisted and automated loading solutions. Automatic sliding doors with safety edge and auto-reverse system. Steam Inlet Pipework Insulation 10-15cu.ft. Steam Inlet Pipework Insulation 21-28cu.ft. Steam Inlet Pipework Insulation 36cu.ft.